Standing at 182 meters tall, the Statue of Unity is built near the Sardar Sarovar Dam in the Narmada district, around 200 kilometers from Ahmedabad. Statue of Unity, the world’s tallest statue, twice the height of the Statue of Liberty in the US, will be unveiled on Wednesday by Prime Minister Narendra Modi in Gujarat’s Narmada district on the birth anniversary of Sardar Vallabhbhai Patel. The Rs 2,989 crore project took 42 months, and round-the-clock work by 3,400 labourers and 250 engineers to complete. The foundation stone of the statue was laid in October 2013 by Modi, who was the chief minister of Gujarat at that time. 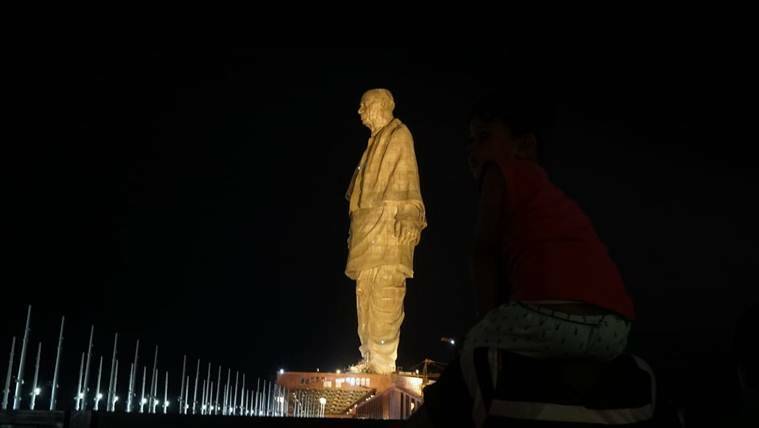 The Statue of Unity beats China’s ‘Spring Temple Buddha’ as the world’s tallest statue. The height was picked as ‘182’ metre to match the total Assembly constituencies in Gujarat.Standing at 182 meters tall, the Statue of Unity is built near the Sardar Sarovar Dam in the Narmada district, around 200 kilometers from Ahmedabad. The height was picked as ‘182’ metre to match the total Assembly constituencies in Gujarat. The statue, however, has drawn flak from tribals and farmers living in the region who were against the enormous cost of the project as well as land acquisition by the government. The statue will have a viewing gallery at a height of 153 m and can accommodate up to 200 visitors at a time. Facilities for the public ranges from Selfie Points created in a 5 km radius around the statue, to a museum at the statue’s base that has artefacts and documents from the life of Sardar Patel, including from his personal life. The museum also has an 8-foot prototype of the head of the Statue of Unity. For accommodation, 3-star hotel with food service, guest amenities, conference facilities is coming up. Two tent cities, comprising 50 and 200 tents, has also been set up on the banks of the Narmada. The Statue will be opened to the public on November 1, at http://www.soutickets.in, on location, and at Shrestha Bharat Bhavan complex nearby. Tickets (Rs 120 for adults, Rs 60 for kids) allow access to the memorial, statue site, Sardar Sarovar Dam etc. Tickets to observation deck cost Rs 350. Bus ride costs Rs 30 or Re 1 (kids); free with observation deck tickets. The Statue is connected to major cities by two state highways. Airport and major railhead in Vadodara, 90 km away. Pratapnagar-Dabhoi-Chandod-Kevadia Colony railway line is set to open next year. Seaplane service planned between Sabarmati riverfront and Panchmuli lake on Narmada canal.